Beautiful nail art comes from beautiful talent, and beautiful colors. The colors I used for today's manicure are really beautiful, especially when paired together. So thanks to Tzadkiel for her inspirational colors. I don't have much else to say about it, other than I love it and dotting tools are clearly the best! The base color is Unicorn from Sinful Colors, and the dots are from For Audrey (China Glaze), Get in the Expresso Lane (OPI), Life Preserver (China Glaze), and Pull Over (Sinful Colors). @Exah I can absolutely picture that haha! @aimeeus You know I didn't actually. I realize now that the pictures make it seemed matted, but it's not. Quite shiny in real life actually. 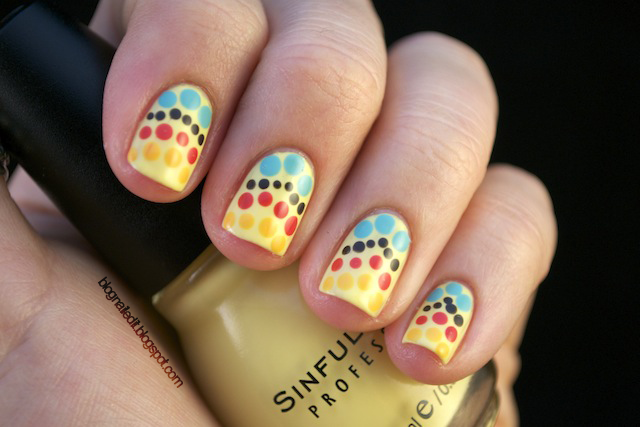 love this mani, it's amazing! WOW-I love this! I'm a dotting failure and am always impressed by others who are not! Thank you so much! My advice for improving dotting is to practice on paper. Consciously think about the pressure you need to get the right sized dot, and you'll be whipping through the process in no time. All you need is a piece of scratch paper, one blob of your polish color on the paper, a polish remover soaked cotton ball, and your tools. Loosen the caps on all your polishes so you can just pull out the wand each time you need a color. Then go nuts!